"...and the view was phenomenal"
Vista Grill is one of Vallarta's most exciting new fine dining restaurants, offering creative contemporary cuisine in the exquisite setting of the original Sr. Chicos Restaurant. With spectacular views of Puerto Vallarta and Banderas Bay, gracious service and attention to detail, along with the finest International cuisine - Vista Grill offers a fine dining experience that is as memorable as it is pleasing to the palate. Vista Grill Restaurant & Lounge is quickly becoming a favorite fine dining restaurant for Puerto Vallarta residents and vacationers who are seeking an extraordinary culinary adventure. Superstar Chef Martin Amezcui raises Vallarta dining to new heights by providing creative dishes with a distinctive flair that delights diners. We love this place, we try to have breakfast there most mornings, they do the best latte on the beach. Food is wonderful, service great. Have dined here several times, and it is a fantastic experience! Will be back in January! This is a can't miss experience. I highly recommend it! Great food & service. Go there when it's dark - then it could be considered very romantic. If during the day or early evening... bugs, vendors, not very romantic. There is no enclosed area, so if looking for some romance & air conditioning, it's not here. Having said that, our meal was excellent and we would certainly come back. Once again, we were treated to an unforgettable evening under the stars with the Bahía in our view and delicious food to please our palates! Not long after opening, Vista Grill was added to my Top Spots to dine in my PV area restaurant guide. Congrats and keep up the superb work! We've been to the grill on each trip to PV..wouldn't miss it! Question? How do you make yourchocolate expresso rib( I think) it's great! We loved your restaurant. We travel every year to PV & just discovered Vista Grill this trip. We would love some of your receipes...especially the tuna....Yum!! Thanks, we will see you next year! Christmas time here was magical! The music superb. Relaxing and wonderful! My friends and I enjoyed the most wonderful dinner last week, when we were in Puerto Vallarta. I just wanted to comment on the breathtaking view, and first rate service. We all agree it was the best dinner we've ever had. We have been there several times and enjoyed it every time. 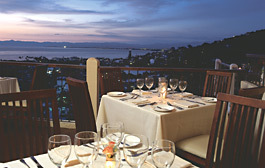 The food and the service was exceptional while the view is one of the best Puerto Vallarta. My wife and enjoyed a great evening on Vista Grill's balcony overlooking Puerto Vallarta. The view, the food and the wine were wonderful. My wife and I ate at Vista Grill in December and what can I say... it was "fantastic!" The staff were superb and the food was the best in PV. If England was not so far away we would be there every week. But I have a question: we had a bottle of red wine French a pinot noir priced about $399 or $499 and would love to know the name of it as France is not so far away we would like to try some more. Our dinner at Vista Grill was the highlight of our visit to Puerto Vallarta last year. This year we are bringing our whole family to see the spectacular view of the city from your balcony. Been there several times. It's great! My wife and I went to Vista Grill for her birthday, and were well treated. Made reservation online, and it was confirmed. We both had beef tenderloin and scallop combo; delicious. Terrific wine selection. View was fantastic and staff attentive. Take a taxi on up to this incredible restaurant. The same owners as la Palapa - you will not be disappointed. Fabulous martini´s, wonderfully prepared food and great service. The view is so panoramic of the city it is just amazing. I would really recommend this restaurant. First of all, the restaurant is immaculate, sparkling clean and elegant. The staff is very professional, very friendly...we had two primary waiters and two secondary waiters. The manager visited us at least twice, to make certain we were satisfied. And, ah! the food! Every morsel from appetizer to dessert was out of this world, the best I´ve had anywhere. I dined at Vista Grill last week while vacationing and I fell in love with it. Not only is the view beautiful, but the food is creative and delicious. The staff was professional and charming. I will recommend this restaurant to everyone I know vacationing in Puerto Vallarta. Great restaurant! Great view, wonderful food. Highly recommend. Several friends of mine and I dined at Vista Grill last Wednesday evening. We were visiting Vallarta from the U.S. and stayed for seven days. Of all of our dining experiences, Vista Grill was the best. The food was delicious and the view was phenomenal. Each of us had a different entree, and all five of us agreed that the meal was exceptionally good, as good as anything in the better restaurants in the States. Congratulations to your chef! Thank you for two fabulous dinners during our visit to PV. The Vista Grill was the highlight of our trip! Alfonso is a superb waiter...he did an excellent job with the beautiful sunset, too! I dined at Vista Grill twice during my 10 day stay in Puerto Vallarta in December 2004 and loved every minute of my dining experience. The view, the decor, the food, the wine, the service, etc. Each visit, I admired the large chandelier/light fixture as you enter the restaurant, so much that I'd like to have it for my home in Buffalo, NY. Can someone let me know where you bought the fixture and/or provide me with contact info. to inquire about the same one. Thank you very much and we look forward to seeing you next year on our 14th visit to Puerto Vallarta! I am planning on celebrating our wedding in Puerto Vallarta on this year. I am also very interested in having our wedding reception on the top deck at Vista Grill Restaurant. I heard it is a perfect location for wedding receptions, and would love more information. We are planning on hosting about 150 guest and I would like to see what we need to do to get our reception booked. Can you please send me pricing on dinner menu options (sit down dinner vs.. buffet) for 150 people and bar cost as well? I have enjoyed your La Palapa Restaurant many times. In fact I still have one of your t-shirts from 10 years ago! Congradulations on Vista Grill, I can't wait to try it. Thank you for serving my two groups such great dinners last month. The service was great as was the menu and food. To top off a great evening you have the best dinning view in the city. I'm sorry we discovered Vista Grill so late in our 3 week visit to Puerto Vallarta. We'll be back next year. Since the start of this year, eight of Puerto Vallarta’s top restaurants have won the coveted International Star Diamond Award, considered one of the most notable achievements in the hospitality industry. At Vista Grill, Executive Chef Sergio Esquivel and his fine group of 'cocineros' present eclectic and creative cuisine, beautifully presented. Add to this top-notch service, gorgeous views, and the special Restaurant Week menu and you'll enjoy an evening that is as memorable as it is unique. Despite the Swine Flu scare in many parts of Mexico, life goes on here in Puerto Vallarta. Wednesday, April 29th at 7 pm, Vista Grill will be hosting a fundraising event to support the Children of the Dump, a non-profit organization that helps the poor children living in and around the city dump. You don't have to be a wine connoisseur to explore the wonderful world of wine this summer. Vista Grill, Puerto Vallarta's favorite restaurant with a view, will be presenting a wine tasting workshop 'Wine from A to Z' on Fridays from Aug 1-Sept 5th. Realizing that fast food can involve much more than just burgers and fries, Alberto Perez, who owns two of the finest restaurants in Puerto Vallarta, La Palapa and Vista Grill, recently opened his latest dining concept, Quimixto Mexican Grill. BanderasNews food writer and restaurant reviewer, Gary R. Beck, pays a visit to Vista Grill and tells us why this restaurant with a view gives out-of-town visitors just one more reason to visit this wonderful paradise called Puerto Vallarta. On October 4th one of the most popular fine dining restaurants in Puerto Vallarta, Vista Grill, received the Five Star Diamond Award from the American Academy of Restaurant and Hospitality Science.